We've received lots of feedback from Wavers that the public waves they read were clogging up their inboxes. 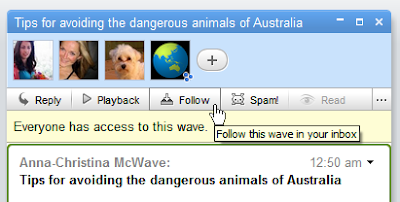 Today, we've introduced a new concept to Google Wave--"following" waves. Now, clicking on a public wave no longer causes it to appear (and stay) in your inbox; you have to explicitly choose to "follow" the wave. Public waves that are in your inbox simply because you opened them at some point in the past will start to leave your inbox as they get updated. You can also manually remove them with the "archive" feature, and they will no longer return. We hope this will help with clearing a backlog of unwanted waves. Please note that the new "unfollow" feature replaces mute. If you no longer want a wave you are on for any reason (whether you created it, added to it or followed it), to show up in your inbox, use "unfollow". You can still find waves that you are not following by searching for them or if you have organized them into saved searches or folders. Following is the first step towards a set of new tools for managing waves in your inbox. In the future, there will be more control over what kinds of changes will cause a wave to appear in your inbox, and we will soon introduce better support for groups of wave users. We're also thinking of expanding the following concept to let you follow people, groups, and searches. In the meantime, let us know what you think of following, check out some other ways to organize your inbox and share your own #wavetips on Twitter.